Yup in a time when we have been watching the June Internationals, casting our eyes onto Roland Garros or enjoying the Hockey World Cup at the Hague, this past weekend also saw the hosting of the PDC World Cup of Darts. More impressively than this was that South Africa were present and did a good job! The tournament runs as a straight knock out with the top 16 ranked sides facing off against the 16 un-ranked sides. In round one it is a best of nine legs doubles, before the format changes for Round 2 until semi-final stage. From there there are two singles matches, each played as a best of 7 legs game and if each team wins one singles, a doubles (Best of 7) match decides the winner. The final is four singles matches and if needed a doubles match to decide the winner. South Africa were represented by Devon Petersen and Graham Filby in the 2014 World Cup of Darts. Devon had previously represented us in the 2012 World Cup where combined with Shawn Hogan they made the Quarter Finals. He would look to do the same in 2014 with Graham. The fairytale ended when the South Africans took on the most decorated nation England. 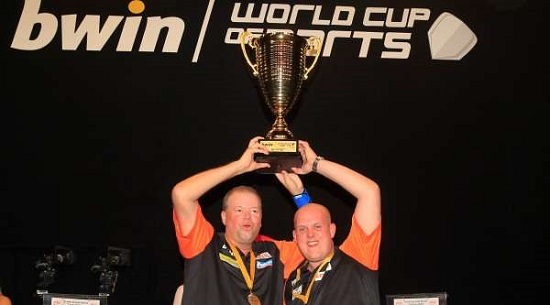 Victories for Phil Taylor and Adrien Lewis ended South Africa’s challenge, but nothing could depreciate our pride! The final would eventually be set up between the defending champions England and the current hot shots of World Darts, the Netherlands. On the night the experienced pairing of Taylor and Lewis were beaten comfortably by Premier League champion Raymond van Barneveld and by World Champion Michael van Gerwen. The result was Netherland’s second World Cup victory to match England’s total. It also means that Holland currently hold the World Cup, the Premier League and the World Championship, the big 3 in PDC darts.